Every penny counts when you're on a limited budget. The ability to put healthy food on the table is a priority. CalFresh is a valuable resource for many eligible low-income families. It enables them to stretch their food dollars. Unfortunately, many individuals are either unaware of the CalFresh Program as an option, don't believe they will qualify, or have received inaccurate information. Formerly called Food Stamps, the program is known in California as CalFresh and nationally as SNAP (Supplemental Nutrition Assistance Program). It is the nation's largest source of nutrition assistance. CalFresh supplements food budgets when individuals or families can't afford enough to eat. Those who are eligible receive an EBT (Electronic Benefit Transfer) card which is loaded with a benefit amount each month. The card may be used at any grocery store or farmer's market that accept it. CalFresh supports productivity, promotes health, and helps prevent hunger. How may I apply for CalFresh? 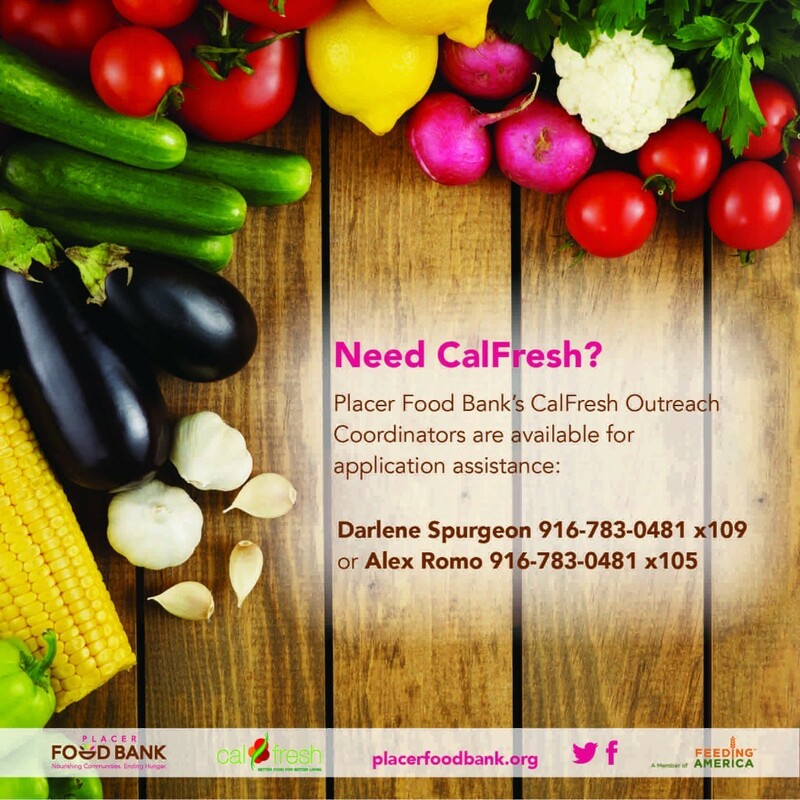 Placer Food Bank's CalFresh team is ready to assist you in either English or Spanish! We want to make the pre-screening and application assistance process an easy one for you. Contact our office by calling 916-783-0481 xlll to schedule an appointment or to find out when we will be at various community outreaches. Our hope is to help as many individuals and families as possible to increase food security, nutritional food options, and peace of mind. If you would like to apply online for CalFresh, visit www.mybenefitscalwin.org. Placer Food Bank is located at 8284 Industrial Avenue, Roseville, CA 95678.